Does your office staff know how to perform CPR? Do they have certifications from the American Heart Association? Are your resort or hotel employees up-to-date with their CPR certifications? Does anyone in your office have a certification expired and in need of CPR renewal training? Space Coast Life Saverz can provide corporate or group training at your facility or office. This is a cost and time effective way to keep your employees or staff up-to-date with CPR, AED and First Aid techniques and certification. Contact us today and arrange for on-site training. We make it a great experience...and it might save someone's life. Simply choose the course you need by clicking the BUY NOW link above, fill out your contact and credit card information, then submit. We will then send you a KEY CODE for that course. 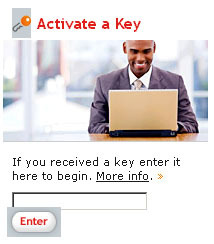 You can sign-in at the AHA Online Training website, and enter the KEY CODE that we sent you. Once you have the KEY CODE go online and find the section that looks like this, and enter the KEY CODE we provided you. Upon completion of that course you can schedule a SKILLS CHECK (if applicable) with us to complete the certification.